Here is a pic of Dev with his boy scout troup. 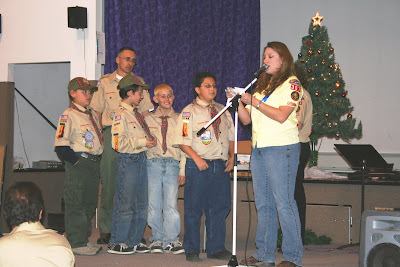 Last night was the boy scout Christmas party/awards ceremony. A grand time was had by all. Sitting with his troup reminded me of my days teaching middle school. It always amazed me when I taught, how the boys were constant sources of jokes- none of which made any sense, but that did not matter. The punchlines were always greeted with gales of laughter from the comedian's peers. Last night we heard several jokes about skeletons- skeletons walking into bars, skeletons knocking on doors, skeletons ordering ribs in restaurants, etc. We had to laugh, if only because of the energetic set up and delivery. Anyway- it was a lovely party and I'm glad I got to be part of it.